Knight’s KSHTC Twin Chain Servo Hoist and KSHTCDM Dual Motor Twin Chain Servo Hoist are Intelligent Assist Devices (IAD) that enable an operator to precisely locate or float a load in the “Z” direction (vertical axis) with speed and reliability. This design specifically helps to control and balance unwieldy or long parts. KSHTC’s two (2) twin chains are mechanically linked together so they operate as one unit. KSHTCDM’s two (2) twin chains are controlled in conjunction with each other. Each motor is electronically synced together with an option of a (LMM) Load Monitoring Module with Operator Controlled Interface or a (LMM) Load Monitoring Module with Pass Through Interface. 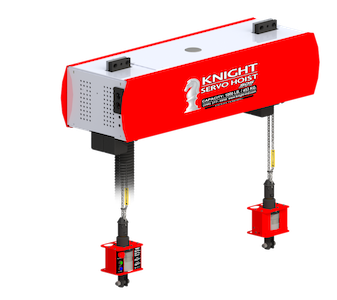 The Twin Chain Servo Hoist allows for many application solutions due to the various programmability features. They enable an operator to simply grasp the handle and move the load, eliminating push buttons. Traditional hoists require the operator to push buttons in order to initiate a natural ergonomic motion. Speeds: Up to 196 ft. per min. [60mpm]. KSHTCDM – Dual Motor Control.